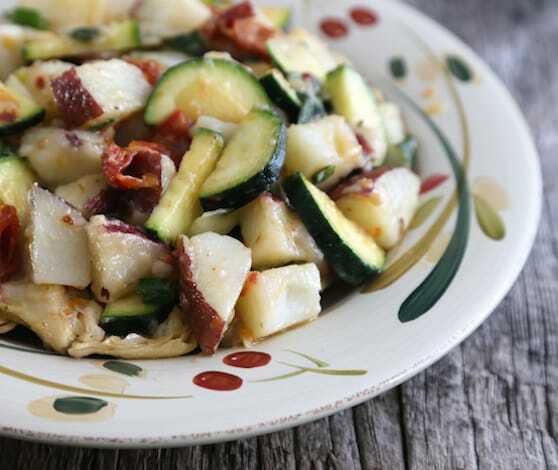 This flavorful warm potato salad, enhanced with zucchini and artichoke hearts, can be made any time of year. Its seasonal personality enhanced by either rosemary (for cooler months) or basil (for warmer weather). Photos by Evan Atlas. 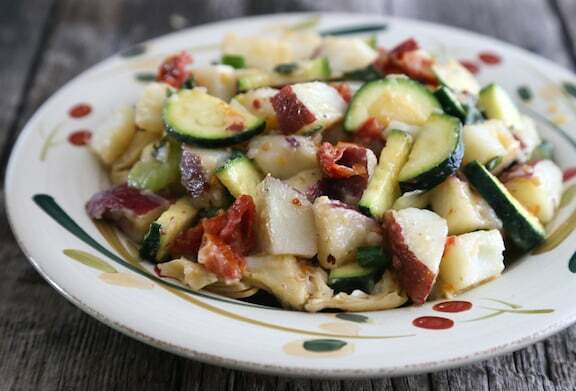 This flavorful warm potato salad, enhanced with zucchini and artichoke hearts, can be made any time of year. Scrub the potatoes well and cook or microwave them in their skins until done but still firm. Halve the zucchini lengthwise, then slice thinly. 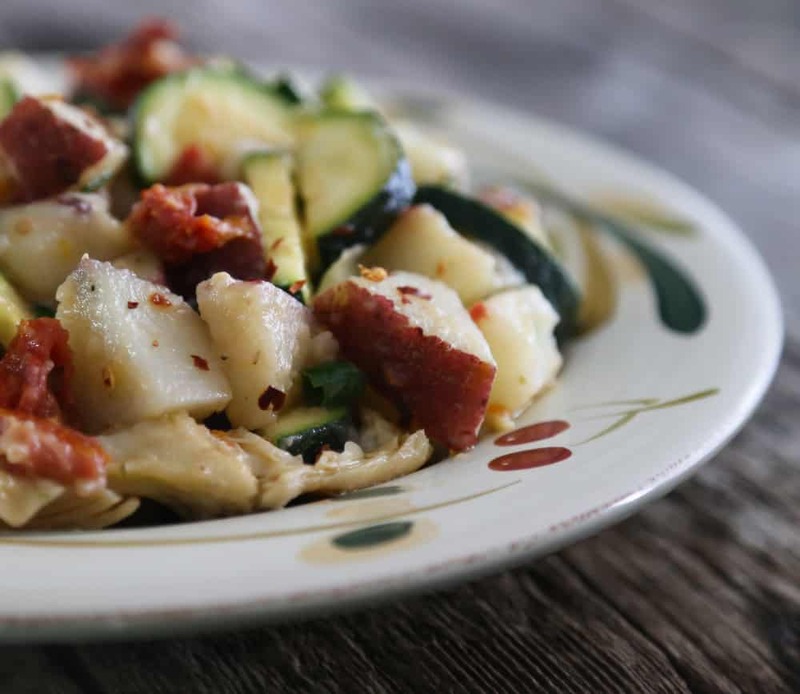 Combine in a serving container with the fennel or celery, artichoke hearts, and dried tomatoes. When the potatoes are just cool enough to handle, but still nice and warm, cut them into large dice and stir into the serving container. Add the fresh herbs (rosemary for a wintery flavor, basil for a more summery taste) and optional pine nuts. Stir gently, then season with vinegar, lemon juice, salt, and pepper. Serve at once. Drain the artichokes or add the marinade? Great question! Add a little of the marinade. Some marinated artichokes are in a more oily base, and it would be fine to add as much of that as you’d like. With the more briny kind, add a little for flavor but not so much as. to make the salad watery. We tried this yesterday. It was cold, with leftover potatoes, but delicious. I’ll try heating the leftovers a tad to see if we like that better. Dried Rosemary is not nearly as tasty as fresh, but we liked it. Next time I will add more sundried tomatoes and pine nuts. Question: Should the artichokes be drained or should the liquid be added to the salad? I did not add the liquid marinade and did not eel that we needed the additional moisture.